In TYPO3 9.5 LTS it has been deprecated (see notice) to extend Extbase classes using TypoScript config.tx_extbase.objects and plugin.tx_%plugin%.objects. In order to migrate existing extensions, which extends another TYPO3 extension, you should now use XLASSes. For my TYPO3 Extension sf_event_mgt I also provide a small demo extension, which shows how to extend domain models and controllers of the main extension. The previous version using config.tx_extbase.objects can be found here. I migrated this demo extension to use XCLASSes instead. For domain models, the important part is the registerImplementation() call, since this instructs Extbase to use the extended domain model when an object is processed by the property mapper. Note, that there are some limitations using XCLASS, so it is highly recommended to read the official documentation. TR;DR - I analyzed 48.146.633 websites for TYPO3 usage - the results with aggregated charts can be found here. I'm proud to introduce my latest side project called t3versions. It is a Python (Django) web application to identify, if a website is running TYPO3 and if so, which major version is being used. As a result, TYPO3 websites are saved to the database in order to create an aggregated overview with several charts. Beside the live check in the frontend part, the application also contains a task queue, which can analyze multiple websites in the background an on multiple servers. I imported a list with 48.146.633 domains of european websites to the task queue and after 21 days, all websites were analyzed. As a result, t3versions did find 292.629 websites using TYPO3. Those websites are located on servers with 61.269 individual IP Addresses. The archived results including 6 charts (Version overview, Supported version, TLDs, Webservers, Countries and SSL) can be found here. I will reschedule the background check on a regular basis. If someone can provide me a list with e.g. Asian or US domains, feel free to contact me. TYPO3 MySQL database import fails with "Index column size too large. The maximum column size is 767 bytes"
ERROR 1709 (HY000) at line 2060: Index column size too large. The maximum column size is 767 bytes. The error occurred for the import of the TYPO3 table sys_refindex. After some research and local debugging I found out, that I locally was using MySQL 5.7 and the production server was using MySQL 5.6, but settings in regard to innodb_large_prefix and innodb_file_format were equal. After setting the ROW_FORMAT to DYNAMIC, the database dump from MySQL 5.7 could finally be imported without errors on the MySQL 5.6 production server. Today I finally released the new version 3.0 of my TYPO3 extension sf_event_mgt - Event management and registration. The new version comes with tons of new features, bugfixes and improvements and also contains 2 breaking changes, so make sure to read the release notes. Thanks to everyone, who contributed to the extension over the last few months. Also a special thanks to Alex Kellner for his extension powermail, from which I adapted ideas and some code for the registration fields feature. Below follows some of the new features of sf_event_mgt 3.0. Im order to make the extension more easy to use for non-programmers, I added the possibility for editors add additional registration fields to the default registration form on event basis. Creating of registration fields works basically as in powermail. 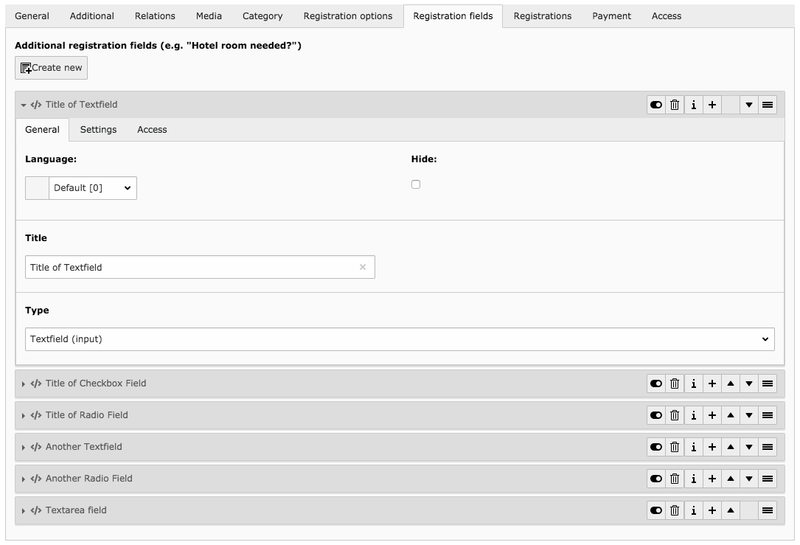 The user can add registrations fields in a new tab as shown in the screenshot above and choose one of the following field types: input, textarea, radio and checkbox. 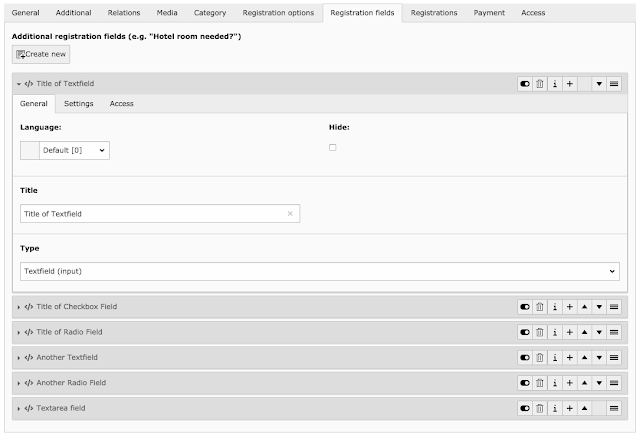 When a participant registers to an event, all filled out registration fields are saved to the registration record in the TYPO3 backend. Finally, I also added signals in various actions, so it is now easily possible to modify/extend variables given to the desired views. Back in 2015, I wrote 2 blogposts (first and second) about rendering a localized Fluid standalone view in a scheduler task (commandController). The main problem was to render a Fluid standalone view multiple times within the same request but with different languages. Back then, my solution was to create an own ViewHelper and a modified version of the TYPO3 LocalizationUtility which were responsible for handling the localization changes during the rendering request. Meanwhile, I got feedback from readers of my blog pointing me to a more simple solution for the problem. The main problem with changing the TYPO3 backend language during one request is the language cache, which is only initialized once for the current language. So when you switch the backend language multiple times, the cached language files for the previous language will still be used. The solution is to unset the language cache for the extension you are rendering your Fluid standalone view from. In order to do so, you have to extend the TYPO3 LocalizationUtility with a new function as shown below. The example code below shows, how to use the resetLocalizationCache method before rendering a Fluid standalone view in a given language. So with a small extension of the LocalizationUtility it is now easily possible to render a Fluid standalone view in a language of choice and it is also possible to switch the language within the same request (e.g. sending out localized e-mails to multiple recipients). I updated the Demo-Extension, which contains a backend module and a command controller for demonstration purposes. I would like to thank Johannes Rebhan for giving me the hint about the localization cache and also Ulrich Fischer for showing me a different approach, which requires more code, but lead to the same result.